The weird weather has been good for the growing season. I've been getting things from the garden up until the hard freeze we had this week. What better way to use the last few decent tomatoes of the year? 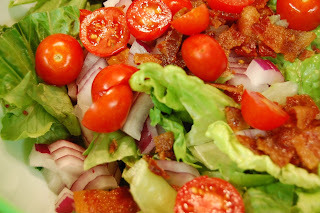 Why, a BLT salad, of course! It's simple. Toss your choice of greens, crumbled bacon, a few tomatoes and some red onion. Top with your choice of dressing. (We used fat-free ranch.) And you're ready to savor the memories of summr gone by. I'm envious of you being able to get garden fresh tomatoes this late in the season! You made great use of them in this salad.